Following his death, a moot was held to determine his successor. Supposedly, Jarl Hanse of Winterhold was the obvious choice for succession, however the Moot's failure to appoint him High King ultimately ignited the War of Succession. Skyrim would spend the next fifty years in turmoil. In 4E 201, an officer of the Stormcloak rebellion, Galmar Stone-Fist, learned of Borgas' place of burial while searching for the fabled Jagged Crown. The Last Dragonborn recovered the crown from Korvanjund amidst a scramble for its recovery between Imperial and Stormcloak soldiers, who fought in the ruins. 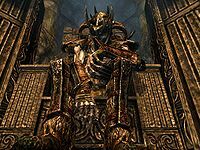 Deep within the ruin, old king Borgas was found slumped on a throne wearing the crown—his ancient corpse having taken the form of a powerful draugr. The crown was recovered from Borgas, but it is unknown whether the crown was given to the Stormcloak leader Ulfric Stormcloak or the Imperial claimant, Elisif the Fair. Whatever the truth, it was said that the crown would have been a potent symbol of legitimacy for either Jarl in their claim to the throne of Skyrim. ^ a b Galmar Stone-Fist's dialogue in Skyrim.